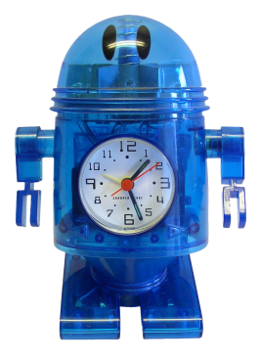 Yet another robot-themed alarm clock that I have no intention of using - I'm not really a morning person. The clock itself, however, is pretty cute. When the alarm goes off, he will do a little dance while sounding a buzzer until you tap him on the top of his head. I'm relatively sure that the now-defunct Sharper Image didn't actually manufacture anything - only branding 'upgraded' products with there company name. Having said that, I'm not really sure who the true maker of this little guy is. There are no clues on the bot itself, and I have as of yet been unable to locate any information about him on the great-wide internet. Thanks to an anonymous user, I came across this video that shows the little robot playing the song "The Robots" or in german "Die Roboter" by Kraftwerk! Pretty cool.